A quiet guest home tucked on a serene hillside in Northern Beaver County. Perfect overnight accommodations for the discriminating traveler. 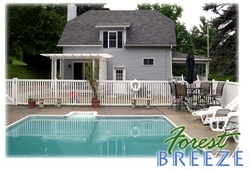 ​Forest Breeze Guest House is owned and operated by the Rodgers Family. Our goal is your complete satisfaction—and a worry free comfortable stay. We offer the kicked back feeling in this lovely home, but also have all of the modern comforts for your convenience. For rates and availability you may contact us at (724) 622-1785 or please continue to browse the rest of the site for more information. a comfortable home with lots of ease. Welcome home to Forest Breeze!